Don't be scared off by the old batches of the meiyu. The new batches are actually pretty good, its only real downside is its speed, which is actually decent after lubing. 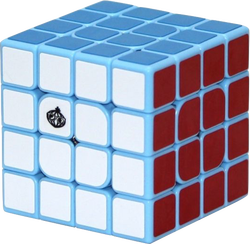 Its outer layers have the best reverse of any cube, but its forwards isn't as good as the aosu (my mini aosu can cut 45. yes you read that right). This cube doesn't lock or catch really for me at all, and it flows well. With some maru and lighter lubes to make it faster, it would probably flow even better. While corner twists don't actually happen ever, they are possible unlike most all other 4x4s, and last of all, popping. It very rarely pops, but when it does (once for me) it absolutely explodes, and with its mechanism it is a pain to put together.